Holy cow! Two boys can eat a lot of food. And, of course, dad has to carry most of it when we go bikepacking. While preparing for our Colorado Trail Segment 1 trip, food became the biggest obstacle. 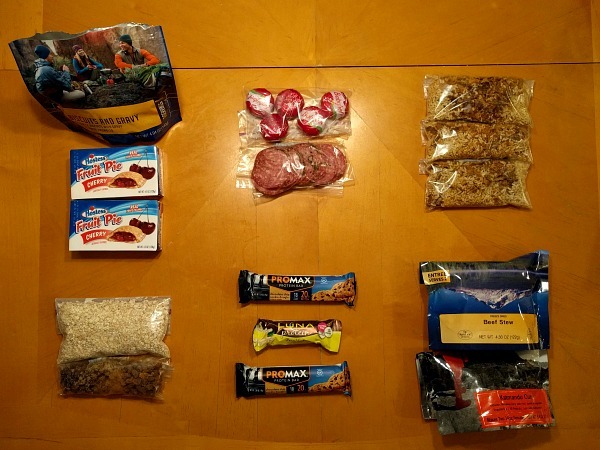 We had a good system for the camping gear, clothing, and JetBoil stove, but where would all of this food go? 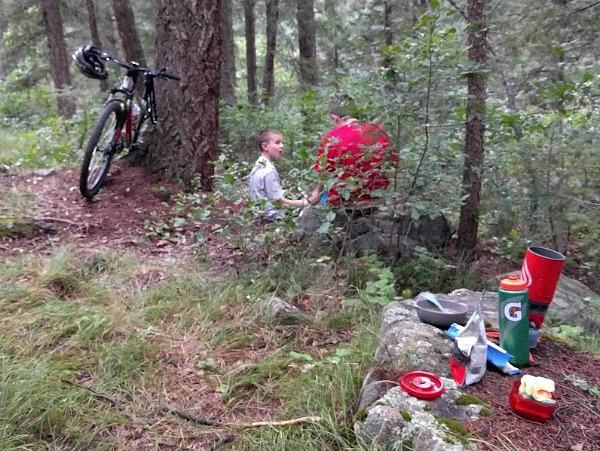 Each kid carried their sleeping bag on their handlebar with water and snacks in a hydration pack. I carried the tent, my sleeping bag, three sleeping pads, all of our clothing and rain jackets, plus the stove. That didn’t leave much room for food. The food. Lots of food. We needed two breakfasts, two lunches, two dinners, and plenty of snacks to keep everyone moving down the trail. Breakfasts on the left, lunches in the middle, and dinners on the right. Snacks, lots and lots of snacks. Yes, dad got the smaller pile on the right. Anything that’s easy to eat and fairly dense. The kids really enjoy the Honey Stinger waffles and Cliff Z-bars. I prefer Lara Bars. New to the kids for this trip was single-serve peanut butter packets. For fun snacks, we enjoyed candied fruit slices (the best trail food around ), Payday candy bars, and dried mango slices. When all laid out, the food completely covered our kitchen table. It was so much food, I could not get it all into a single picture. How on earth was I supposed to pack and ride with all of that? On a solo trip, this amount of food would keep me going for a week. I put my assortment of OPSAK bags to use. 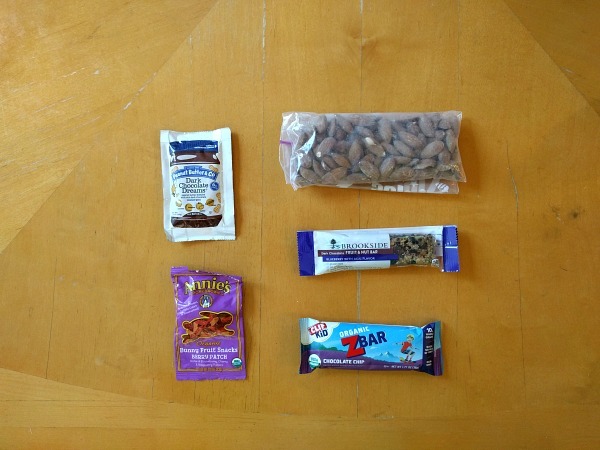 Each person used a 9×10 to pack their individual snacks. When filled, the bag fits into my frame bag and the kid’s hydration packs providing easy access for trailside snacks. 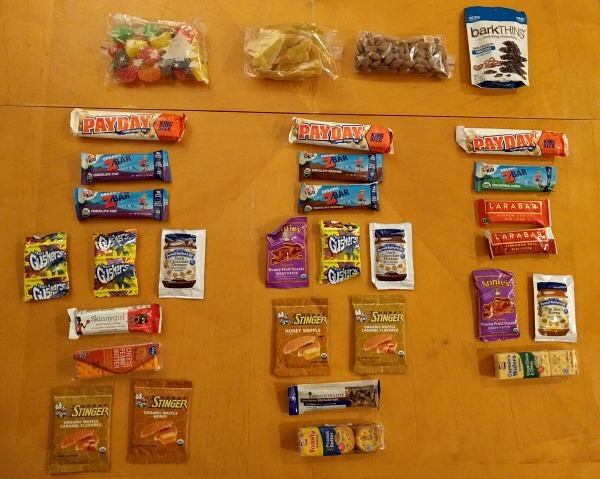 The shared snacks (at the top of the snacks picture) plus all of the meals went into a large 12×20 OPSAK bag. The bags are sturdy and hold up to kids shoving them in and out of their packs. The large OPSAK provided odor proof storage. Enjoying our first dinner. I like the think the boys are amazed at how I carried all of the food and then cooked such a delicious meal. The freeze-dried meals definitely take up more space and are much more expensive. The tradeoff is absolutely no cleanup because all you have to do is boil water and pour it into the pouch. The homemade rice and beans with Fritos on top has become one of our favorite camping meal. For three people and one stove, this meal takes longer to prepare. Each person’s meal must be simmered for several minutes. This means that the kids are finished eating and running around while dad sits by the stove waiting for his meal to finish. I’m ok with that scenario if it means less bulk to carry and cheaper meals. Plus, eating Fritos on a camping trip makes it more fun. As my boys get older, I realize this may be a phrase that slips from my vocabulary. When we reach the South Platte River on the third day, we had very few food items remaining. The only food that made it home. Enough for one, maybe two, more snacks. Next year, when we tackle segments 2 and 3, I have a feeling there will be even more food to pack. But the boys will also be bigger so they can carry more of the load. Shhhh, don’t tell them about that yet. No matter how much food we pack, my 3 sons always eat it all plus some of my food plus some of the other adults’ food! I have found that sandwich rounds or tortillas plus honey peanut butter is a treat worth the weight of the peanut butter. Yes, they have a way eating everything! Good idea with the peanut butter. While we were riding, we met a guy riding the entire trail and he packed tortilla, a jar of PB, and a jar of jelly. He said the weight didn’t matter because it was always a test treat.